In Keen 4-6, is the "JOYSTICK MENU" bitmap used for both the Gravis Gamepad and the Joystick configuration menu? I don't know since I don't have these, that's why I'm asking. So it looks like the answer is yes. Other games might handle this differently. For example, Bio Menace and Atroxian Realm don't have an option for the gravis gamepad and I think the early releases of Keen 4-6 didn't have it either. Yeah, I remember that earlier Keen 4-6 versions didn't have Gravis support. Anyway, I mean if I choose "USE JOYSTICK #1" (regularly! ), then the "Move Joystick to upper left and press button #1" text will appear at the bottom of the menu? And if I choose "USE JOYSTICK #2" (regularly! ), then the "Move Joystick to lower right and press button #2" text will appear at the bottom of the menu? Just asking as I tested these 2 cases with patches in Keen 4 for example (I replaced two to test these like I said) and when I chose "USE JOYSTICK #2", then the "Move Joystick to upper left and press button #1" text appeared instead of "Move Joystick to lower right and press button #2" text. Also, what happens if I choose "USE GRAVIS GAMEPAD (OFF)" option? The Gravis menu will appear (that you also showed in your post) or "USE GRAVIS GAMEPAD (ON)" window appears? Help me. It doesn't matter which joystick number you slect, the calibration will always ask you to move the stick in the upper left and press button #1, then move the stick to the bottom right and press button #2. That's the standard joystick calibration routine that has been used in nearly all of Carmack's and Romero's games for the PC, starting with Catacomb and Dangerous Dave from the Gamer's Edge sampler disk. once the joystick is calibrated, you can select the "use gravis gamepad (off)" option to take advantage of all 4 buttons (regular joysticks only had 1 stick and 2 buttons back in the day), which will bring up the gravis screen I posted earlier. The gravis option is disabled until the joystick has been calibrated. if you did select the gravis option, you can then map the four actions JUMP, POGO, FIRE and STATUS to the four buttons (in that order). once you selected the "use gravis gamepad" option and mapped the buttons, the option changes from "(off)" to "(on)"
slecting the "use gravis gamepad (on)" option turns it back off without showing any other menu screens or messages. 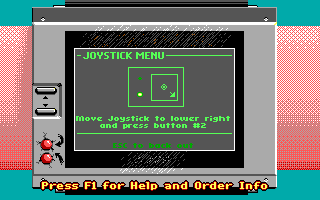 Note that the gravis gamepad basically works as two joysticks as far as the standard hardware interface on a DOS PC is concerned, meaning that it uses the stick and two buttons from joystick #1 and the two buttons from joystick #2 for the two additional buttons (when the gamepad is in 4-button mode). Because of that I'm not sure if it's possible to use the gravis gamepad option after only calibrating joystick #2. At least I couldn't get joystick #2 to work in combination with the gravis option. Thanks for informing about these! I never knew that this calibration works like this. Can I see a screenshot of moving to right corner and the gravis on/off usage? I'm curious. And it seems I was wrong about joystick #2 not working in combination with the gravis gamepad. It did work this time (not shown in the screenshots, though). Probably an issue with the DOSBox config I was using before on the other system. Wanna thank you for the screenshots and the configuration steps! I wonder how many Keeners (or people in general over the past 29 years) have used these devices in any serious way for playing Keen. I certainly have never seen either a joystick or a Gravis Gamepad in real life. Well, as long as you're using DOSBox, you should be able to map the joystick inputs to keys on your keyboard by using DOSBox's keymapper (CTRL+F1), allowing you to emulate a joystick without having to actually own a joystick/gamepad. But admit I I had some trouble getting that to work, so I ended up plugging in a USB gamepad to take these screenshots. I wonder how many Keeners (or people in general over the past 29 years) have used these devices in any serious way for playing Keen. Never used a Gravis gamepad or any of those older joysticks myself, but one of my brothers would sometimes use an Xbox controller to seriously play Keen. He had to use a special program that would convert the controller input into keyboard data, since, if I remember correctly, Keen did not have support for his specific type of controller. Edit: Turns out I remembered that wrong. The original Keen games did recognize his gamepad, but he was using an external program to assign extra functions to more buttons, such as "Enter" to the "Start" button and an automatic name-typing macro. It was other games he had to use the program for because of incompatibility. Last edited by proYorp on Thu Jan 24, 2019 0:33, edited 1 time in total.